Rugby League and cricket may not be immediately obvious bedfellows when it comes to extending active sporting opportunities to young people in the local community. But that is precisely what the respective Foundations of Super League club Salford Red Devils and the Lancashire County Cricket Club are doing, as they work in partnership to deliver their Sporting Foundations for Life programme across Salford and Trafford. This project was launched to build on the popular legacies of the 2013 Rugby League World Cup and Ashes Series - in which Salford’s AJ Bell Stadium and the Old Trafford cricket ground had respectively played host. And now, approaching the end of its second year, the project has inspired a young generation of sports fans by providing weekly afternoon and evening activities for thousands at their schools, colleges, amateur sports clubs and youth and community groups. 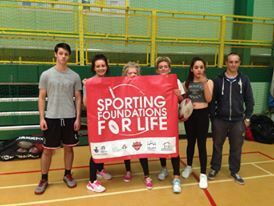 Not just rugby league and cricket sessions are on offer either, as the Red Devils and Lancashire CCC Foundations help deliver a wide range of other team sports such as basketball and football, together with training in several non-competitive disciplines that include dance and self-defence. The benefits for participants are manifold, for these are youngsters who will have previously reduced the amount of time they spent on physical activity - or even given it up altogether. As well as their more obvious positive implications for health, fitness and skill levels, the activities have a tangible social value - both in the way they improve the confidence of young people who take part and, more widely, in the sense of cohesion they help engender among the local communities. But while the two professional sports clubs are using their power in a positive way to encourage participation, what they do not do is dictate what activities are on offer. For Sporting Foundations, as a programme, is properly needs-led - with its young participants not only having a say in the type of sessions on offer but also helping to shape them. And the project further embeds this approach by recruiting from within the youth population local volunteer Community Champions, who are themselves trained up to develop, deliver and maintain sporting activities for their peers. Matt Ratcliffe, 14, is a Year 10 pupil from Altrincham who plays rugby league as a second-row forward for the South Trafford Raiders’ Under-15s side. He became a Community Champion after first going along with a friend to one of the Sporting Foundations sessions at the club two years ago. “Salford Red Devils approached me about volunteering,” he explains. “And now I help the head coach to train the younger-age groups here on Thursday evenings. Coach Tim Martin wholeheartedly welcomes the support he receives from Matt, who is also currently working towards his Duke of Edinburgh Award. It is qualitative feedback like this that is equally as valuable to the respective Foundations’ Project Activators as the participation data they compile for Sport England, in its capacity as the programme’s principal funding body. Sara Davis (Red Devils) and Howard Shore (Lancashire CCC) work in close liaison with each other, as well as with the City West and Trafford Housing Trusts, to ensure that the broadest possible, and most relevant, offer can be made to help local youngsters get active. And, as Howard stresses, “what we hear from the young people and their communities about the benefits they gain is vital to us. And in turn Sporting Foundations will be sure to make a lasting difference for the better around Salford and Trafford. The Rugby League and Cricket World Cups in 2023 look set to be followed - and emulated - there with a passion!